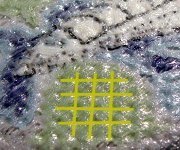 When talking about embroidered patches the term 'tail' is commonly-used to refer to the excess material which is found where the border of the patch overlaps itself. 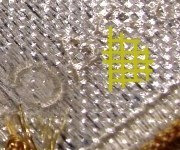 The tail cannot be trimmed away as this could lead to the loose ends unravelling so instead the tail is usually glued across the back of the patch, as seen on AB Emblem Apollo-era space patches for example. Lion Brothers themselves used this technique on their later Space Shuttle era patches, although they are better-known for their 'tail-less' Apollo-era patches. 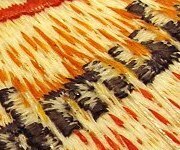 A more elegant finish is produced by pulling the loose tail through the border thread where it overlaps and sewing it in place with an overedge stitch, producing a finish known as 'selvedged'. This process is time consuming as it has to be done by hand but was used by Lion Brothers through to the early-mid 80s when they switched to different machinery and the use of plastic backings. It's worth noting that although AB Emblem did not produce selvedged patches other space patch manufacturers at the time, including Voyager Emblems and Texas Art Embroidery, did use this technique. Throughout the Apollo-era Lion Brothers produced patches without any visible coating on the reverse, although it's worth noting that these 'bare cloth' backs were in fact treated with vegetable starch for stiffness. They continued to produce these bare cloth back patches through the early shuttle years but at a certain time they introduced a plastic coating to the process and their last space patches used a vacuum-sealed plastic backing. 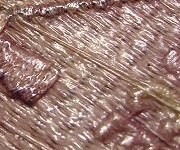 The close-up images below show examples of these different backing types in detail. Patches backed only with vegetable starch, generally referred to as bare cloth backing. Plastic backing that appears smoothed-across with little or no sign of indentations. 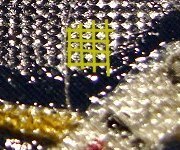 Seen on the plastic-backed version of STS-2, and to a lesser extent on later plastic-backed patches. Plastic backing imprinted with small circular indentations arranged in a square grid. Thin shiny plastic coating vacuum-sealed to the back of the patch (follows closely the contours of the back). Confusingly, this coating is identical to that used on the backs of Eagle Crest & Swiss Artex patches. For comparison, AB Emblem appear to have used two different backing types on their vintage Shuttle-era patches, one soft and waxy and the other plastic. 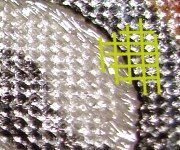 The plastic backing is fairly similar to that used by Lion Brothers but the pattern of indentations is different as shown below. Soft wax backing imprinted with large shallow circular indentations arranged in a square grid. Plastic backing imprinted with small circular indentations arranged in an offset (not square) grid. It is well known that whilst most space patch manufacturers (including AB Emblem) switched from bare cloth backs to a plastic or wax coating in the early-mid 70s, Lion Brothers continued to produce their patches without any coatings through to the early-mid 1980s. 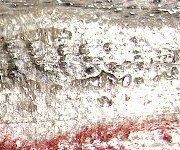 What is not so widely known is that they did in fact experiment with a plastic coating in 1972, at the time of the Apollo 17 mission. The Apollo 17 patch shown on the right is an extremely rare example of the results of this experimentation, as the process was never taken into production. The coating appears to be thin plastic and it's worth noting that the experiment was not very successful as the patch is slightly warped overall. This may be why they decided not to adopt the process at the time. In late 1983 or early 1984 it appears that Lion Brothers introduced new machinery and plastic backings to the Shuttle patches being produced at the time. At this time the company would have been faced with the decision whether or not to continue to produce patches for the Apollo missions using this new machinery and the plastic-coated backs. I believe that they did produce a run of prototype patches for the Apollo missions and that the set of plastic-backed patches shown in the middle column of the Apollo patch list are examples of the result of this experimentation. These patches follow closely the patterns of the original Lion Brothers patches, even to the extent of including versions of the hallmarks, but are in general a little cruder in term of level of detail, a characteristic of modern embroidery machines. The set I have came from two different sources, both estate sales, and the patches were sold without any particular value being put on them which implies they were not created recently to cash-in on the current value of Lion Brothers patches. If they were fakes or replicas I would expect them to be quite commonly-seen as to be economical the minimum run of such custom patches would be in the hundreds at least. If they were fakes intended to be sold for profit you would also assume the person that had them created would be trying to sell them somewhere at regular Lion Brothers prices in order to make some money from them but I've never seen this done. Indeed, the price I paid for these patches was less than what they would cost to produce new. The images below show the pattern of indentations on the backs of two of these plastic-backed Apollo patches. 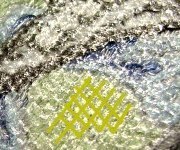 Plastic backing imprinted with small circular indentations arranged in a square grid. Apollo 9 patch. Plastic backing imprinted with small circular indentations arranged in a square grid. Skylab 3 patch. If you compare these to the two images below it seems that the pattern matches very closely that seen on the Lion Brothers Shuttle-era plastic backed patches. The AB Emblem offset pattern is completely different. This would imply that these patches were produced around the time production was switched to the new machinery and plastic backings brought in after STS-9 (Nov 1983) and used for runs of patches for STS-1/2/5/6/7/8 and 41-C. By early 1984 production was switched to vacuum-sealed backings. 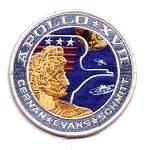 My impression is that the decision was made to abandon the production of Apollo patches at this time and so these plastic-backed versions never went into full-scale production. The table below shows the type of backings seen used by Lion Brothers for their different Shuttle mission patches, with filled boxes indicating where a particular backing type has been seen for that mission. Variant Variant Variant Variant A Exists? Exists? As can be seen the story is not a simple progression from one backing to the next. Some expected combinations of mission and backings are either very rare or seem to be missing altogether. For example, whilst the bare back versions of STS-1 through STS-4 and STS-9 are common, the bare back STS-5 and 6 versions are extremely rare and 7 & 8 seem impossible to locate. It seems that the first backing to be introduced was the plastic coating. At this point new versions of the STS Program, and STS-1, 2 and STS-5-8 patches were created. STS-41C has this backing too but not STS-41B. Maybe the complete run of STS-41C patches were produced before those of STS-41B. Finally the vacuum sealed backing was brought in for STS-41B and, apart from STS-41C, was used thereafter. It seems that they also produced a further run of STS Program and ALT patches with this backing.